The site is convenient for all the classic crags around Gogarth, in addition to Holyhead Mountain and the sea cliffs at Rhoscolyn. It is approximately seven miles from the parking at South Stack via Trearddur and Porth Dafarch, and it is a similar distance through Holyhead to the Breakwater Country Park for access to Wen Zawn and North Stack. The nearest pub, the White Eagle at Rhoscolyn, is just a short walk away along the sandy beach at Borthwen. This is usually a very busy pub, popular with the recently married royal couple, and serves good but quite expensive food(main courses shown on their website currently range from £11 to £16). If people prefer, we might be better off investigating other pubs around Four Mile Bridge. Low tide will be approximately 2:30pm on Saturday afternoon. 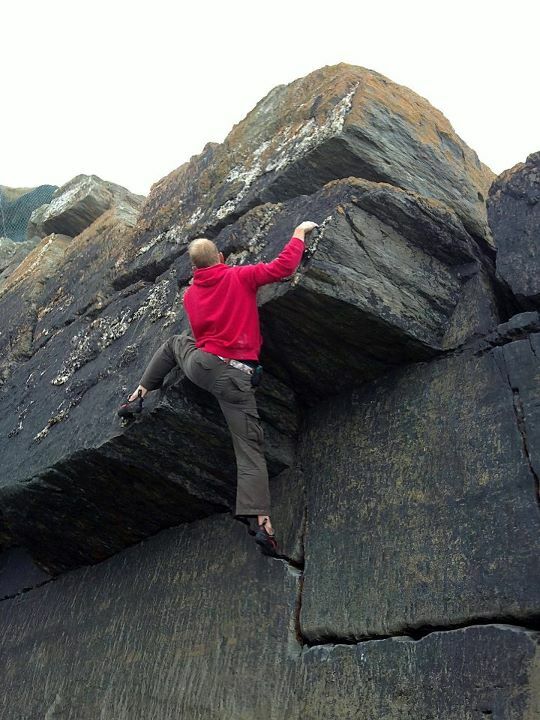 You can check the tide times for yourself on the Climbers' Club website. 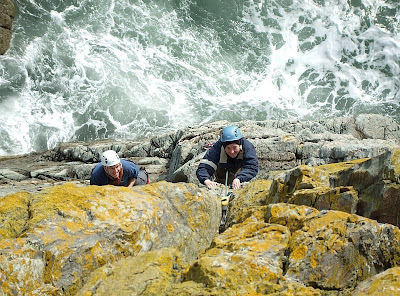 For anyone seeking inspiration, on our website there are lots of photos and reports from previous trips to Anglesey. I was starting to wonder if it was something to do with me, or whether it’s just what it’s like down in Mid Wales, because over the course of two previous weekend club meets there seems to have been a disproportionate amount of rain, wind, heather-bashing, and bog-trotting. 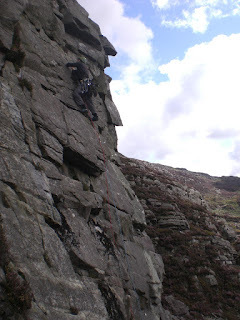 Thankfully, there were several other keen club members willing to suffer for a flavour of what rock climbing in Southern Snowdonia is like. I joined Andy G and Chris M at the campsite[Editor's Note: You actually met us in the pub, Graham! The Unicorn, remember?] on Friday, with Andy C and Mike A arriving hand-in-hand with the rain on Saturday morning. 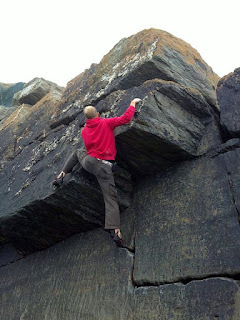 A decision was made – over a morning cuppa, naturally – to go bouldering down the coast at Cae Du, in the hope that it might see better weather than the hills further inland. Good decision! 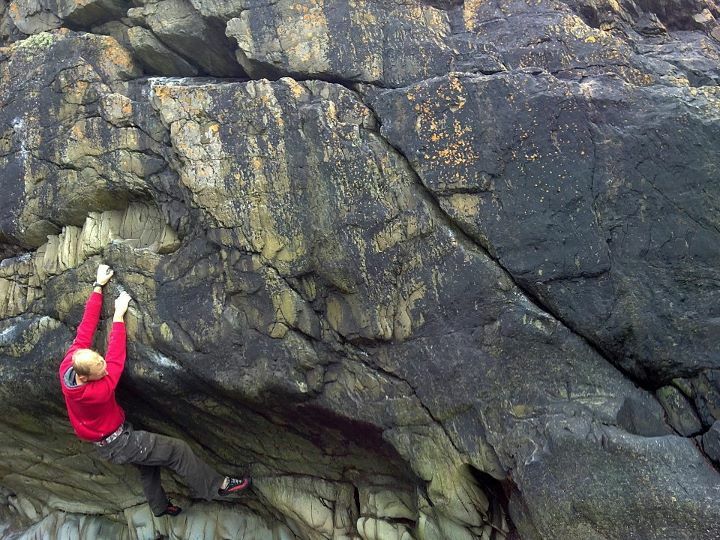 The rock was dry, there was a handy cave for the one brief rain shower, the tide was out, and plenty of problems got done along with a couple of cheeky solos of a few easier and longer up lines. Sheila B and Sian(who some members will remember from a few years ago) sailed in with the overnight rain, but it did dry out enough to goad us into the Rhinogs for a sample of the not-so-famed Welsh grit(really!). An expedition was launched last year to do the same, but a slight miscalculation led to a three hour detour to the crag, through heather and bog, only to not climb because we were all so knackered! However, we found we could get back to the car in only 20 minutes! So, everyone on this year’s trip was duly informed that it’s virtually road-side. But it turns out it's harder going uphill and takes more like an hour or so. Anyway, we arrived at the crag to be greeted by our old pal Mr Rain. Shelter was sought but not really found, cake was shared, the rain subsided, the crag was inspected and the rock slowly dried out enough for three teams to cover more ground in one afternoon than this crag probably sees in a year. 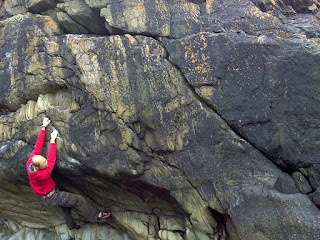 As Andy G said, it was Welsh and it was gritty, and Chris M certainly seemed to enjoy his lead of Endangered Species (VS 4c, 1*). Amazingly it only rained a little bit overnight on Sunday evening. But the chances of any of the big crags of the area being dry on Monday were slim to none. A brief morning shower was enough to convince Mike A and Sheila B to head home. Andy C drove over to Llangollen for a blast on his mountain bike. And for some crazy reason Sian opted for a run up CadairIdris. That left Chris M, Andy G and myself to meet Ste M near Bala to make the supposed leisurely 30 minute stroll to Simdde Du. Ste M drifted in from St. Helens on a strong wind, shortly after we’d arrived at the parking, and we duly headed up the track to the small reservoir under the crag. This alone took 20 minutes, and the crag was high on the hillside, separated from us by a swathe of heather, boulders, and boggy ground. Andy G clocked the approach time as 1hr 45mins – so be warned! Still, this part of the crag faces south, it was sheltered from the wind, and The Emperor’s New Toes (VS 4c, 2*) and the first pitch of Gyllion (HVS 5a, 3*) provided a large enough sample of quality rock and climbing to justify the effort. Given a day or so of dry weather the upper parts of the crag would also dry out and it would be a magnificent place to climb, with some excellent looking routes(look at the cover of the Meirionydd guide for a sample view). 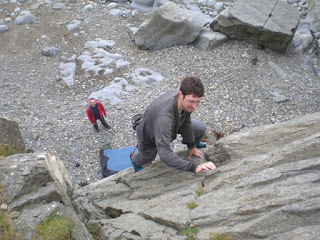 And that kind of sums up what I’ve learnt about climbing in this part of Wales. Take what the guide says with a pinch of salt, put in the effort and persevere on the overgrown approaches, and allow a suitable dry spell beforehand (this can apparently be up to weeks for parts of Crag Cywarch!). 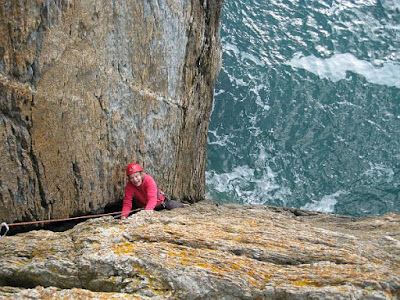 Do all this and there is some excellent climbing to be found in remote and stunning locations, with an almost 100% guarantee of having a crag to yourself. Perfect.